Full visibility both before and after an incident or natural disaster. Arch Aerial LLC enterprise drone services allow operations managers and facility personnel to have completely visibility across their asset portfolio through annual documentation. In the event that an incident or natural disaster occurs, customers can deploy Arch Aerial LLC personnel for monitoring and surveillance of any asset throughout the response period. It's full visibility both before and after the incident. Through an enterprise service agreement with Arch Aerial, your firm can utilize annual mapping and data collection for emergency response planning, and pre-incident site documentation. Reporting includes aerial photography, aerial videography, aerial mapping, 3D modeling (photogrammetry), 3D modeling (LiDAR), and interior 3D modeling. No longer do our customers need to rely on outdated techniques to make crucial decisions, especially when it comes to 3D modeling and conducting volumetric analysis on dikes around assets. Today, leading engineering firms rely on Arch Aerial’s 3D modeling services. Arch Aerial specializes in operating drones (UAS), processing the data, and delivering actionable deliverables to our customers. 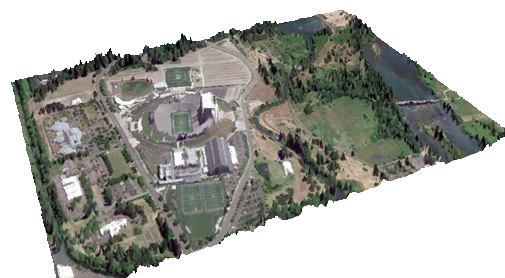 Our 3D point clouds are all georeferenced and have survey grade accuracy. Finally, our point cloud deliverables can be imported into many different software applications (e.g. AutoDesk software, etc.). Immediate data and customized reporting during incident response.